Motorcycle accidents can prove particularly devastating. While car and truck operators have the added protection of their vehicle’s structure, the open nature of a motorcycle places cyclists at a considerable risk of injury and death. The skilled attorneys of Harris Lowry Manton LLP assist numerous motorcycle accident victims and their loved ones with the financial challenges of a motorcycle accident. If you or a family member was injured, contact our experienced Atlanta motorcycle injury lawyers. We have a proven track record of success in large verdict cases. Motorcycle defects. Many motorcycle accidents are caused by deficiencies in the bike. Defective tires, brakes, or other mechanical parts may cause the crash or prevent the motorcyclist from controlling the vehicle in an emergency situation. Defective and dangerous roadways. Defective roadways create dangerous conditions for motorcycle operators. 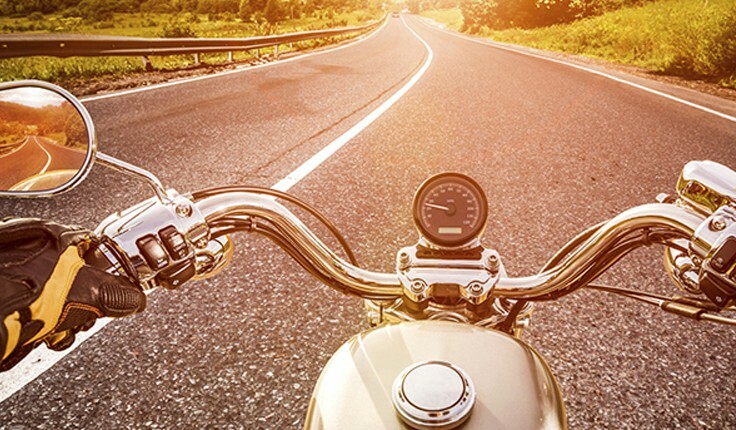 Inadequate shoulders, crumbling road surfaces, or slippery conditions can make it impossible for motorcyclists to safely handle curves or recover when pushed off the side of the road by other negligent drivers. Negligent drivers. When traversing the roadways, motorcyclists are easily impacted by the actions of others. All too often, vehicle operators drive distracted while eating, putting on makeup, or talking on a cell phone. Even one second of distraction can lead to an injurious motorcycle accident. A knowledgeable Atlanta motorcycle accident lawyer understands the challenges of proving fault in any accident and works diligently to secure the compensation your injuries deserve. Brain injury. Though motorcyclists wear helmets, this protective headgear is not foolproof. The impact of a crash can still result in injury to the head, from a temporary concussion to a debilitating coma. Biker’s arm. Motorcyclists are often thrown from their bikes during an accident. When this occurs, they generally reach their arms out in an effort to brace for impact. As a result, the arm can be severely injured by a broken bone or nerve damage. Road rash. This occurs when the impact of the accident causes an operator to slide across the roadway. The pavement can scrape away the cyclist’s clothing and even skin, potentially causing burning, infection, or nerve damage. Through consultations with your medical specialists and life care planners, we work to understand the extent of your injuries and the impact the injuries will have on your future. Our accomplished Atlanta motorcycle injury attorneys build a case that helps you recover the compensation necessary to cope with the financial burdens associated with these serious injuries. The potential consequences of a motorcycle accidents can be catastrophic, or even fatal. The Atlanta motorcycle accident lawyers of HLM are known for their effective trial practice and high commitment to their clients. Our lawyers have successfully pursued more than $750 million in verdicts and settlements. Put our experience to work in your case. Call us today at our Atlanta office at 404-998-8847 or our Savannah office at 912-417-3774, or complete our contact form to schedule a free consultation.